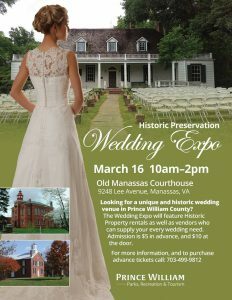 The Historic Preservation Wedding Expo is a week away! Meet representatives from Bergerons, BluSage Catering, Ron Bailey Photography, Sammy’s Rentals, Statements The Salon, Edibles Incredible! Desserts, Calling Card Events, Fleet Transportation Services, Sugar Rim Bar, PHP Agency, Sugar Shack Donuts and Coffee, RE/MAX, First Savings Mortgage, Popped Republic, Hampton Inn Manassas, and more! Food samples and take-away gifts! Saturday, March 16, from 10 am to 2 pm. $5 advanced admission, $10 at the door. Register at 703-499-9812 or email JAlicea@pwcgov.org.